New species of archaic humans seem to pop up pretty frequently these days. If you accept the evolution by natural selection model, then the human lineage is less of a linear progression from primate ancestors, and more of a messy demolition derby of sub-species which came and went, branching out into dead-end alleys of development. 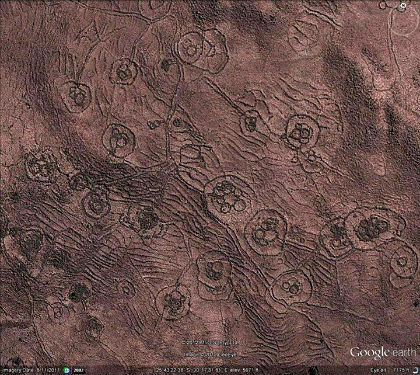 Only one line survived the ravages of the last few hundred thousand years - us. The remains of the rest, the human species which didn't make it and succumbed to extinction, like Homo floresiensis, are being dug out of caves around the world. The latest of these discoveries are the Homo naledi hominins, who appear to have lived in southern Africa some 300,000 years ago around the same time that early humans were emerging as a species (1). The remains of these hominins was discovered in the Rising Star cave system in South Africa a couple of years ago (2). 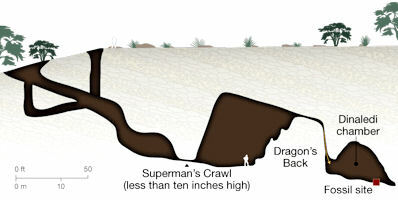 The bones littered a pit-like chamber which was very difficult to access. The bones provide palaeontologists with a curious set of archaic specimens. The small skull size of Homo naledi, providing space for a brain just half the size of a modern human, indicated a primitive hominin. 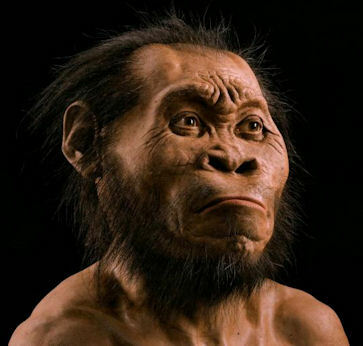 So, the given scientific name of this hybrid creature literally means 'star man' ('Homo' is Latin for 'man', 'Naledi' is Sotho for 'star'). Honestly, I'm not making this up! We have a species which retains the capacity to move through tree-tops (as evidenced by the ape-like curvature of some of its finger bones), but yet is designed to move long distances across the savannah (which can be concluded from the human-like architecture of its legs and feet). Its pea-brained skull indicates a lack of capacity for higher level thinking, as provided by the remarkable expansion of the neocortex part of the human brain. This is, I would say, rather at odds with the hypothesis that an archaic hominin species had managed to survive a couple of million years within a fiercely competitive environment that it was not tailored to deal with. This prototype 'hybrid' was clearly not the brightest spark on the prairie. To be able to move so deeply into such complex cave systems implies the need for fire, which is a remarkable adaptation for hominins with such small brain sizes. This anomaly implies Homo naledi were in some way assisted, or instructed in the use of fire. If Sitchin was right (and it would overturn the entire palaeontology bone-cart if he was) then Homo naledi, intriguingly called the 'star man' by scientists, represents one of the early experiments designed to create a malleable worker drone to service the gold mines of Africa. His use would have been limited, because he was, frankly, probably pretty stupid, and so eventually further genetic work came up with a far superior working model: Homo sapiens. Other mysterious features of the South African landscape may fit in with these possibilities, as described in earlier blogs (8). The widespread scattering of ancient corrals across the landscape of southern Africa implies an industrial scale level of activity, orchestrated in a highly organised manner. Returning briefly to the issue of tidally-locked worlds. Like our own Moon, planets/moons orbiting close to a sub-brown dwarf 'star' would probably be tidally-locked. Due to the tidal effects of the parent's gravitational pull upon the interior of the orbiting moon, the moon is slowly forced into a rotational period that is synchronous with its orbital period. Essentially, one half of the moon is locked in place, permanently facing the more massive parent body. (Here on Earth, the same tidal effects are experienced in reverse, too, as the oceans are pulled back and forth by the gravitational tug of the Moon). This has implications for the potential for life to exist on such a world. Unlike the Moon, which is lit and heated by radiation from the Sun, which lies outside the two-body Earth-Moon system, and therefore gets distributed around the surface evenly over the course of a month's cycle, a tidally-locked world orbiting a dwarf star is always lit and heated from the same direction. I first included this consideration into my Dark Star theory in my second novel 'The Followers of Horus', where I described a habitable planet orbiting the Dark Star in a tidally-locked manner. This 'home-world' was described in the novel as the 'Eye of Horus', perpetually gazing upon its parent 'star' (1). The hemisphere facing away from the Dark Star (a sub-brown dwarf located deep in the solar system) was entirely frozen over as an inhabitable wasteland. 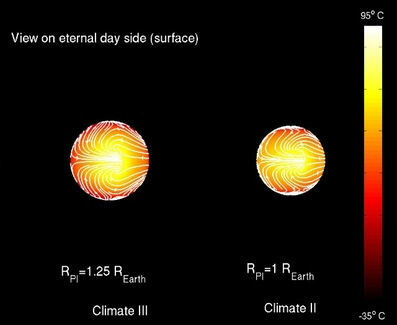 The side facing the Dark Star enjoyed the eternal lightshow of the sub-brown dwarf's aurorae and associated magnetic turbulence, as well as the dual impact of tidal-heating and direct warming. Since I wrote about these possibilities, quite a lot of work has been done by scientists exploring the potential for life-bearing worlds orbiting red dwarf stars (2,3). the issues can be quite complex, but centre upon the weather systems of such a world, and whether there might naturally arise a form of air-conditioning to moderate temperatures (4). 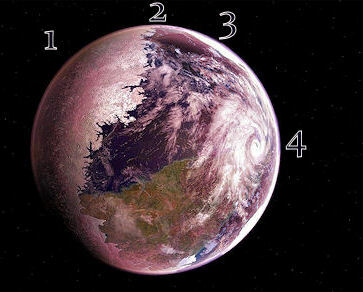 Of course, a sub-brown dwarf would subject its own system to a much less feverish set of conditions than even a red dwarf. Arguably, it would be incapable of driving an atmosphere in one of its neighbouring moons - but if it were capable of such a thing (and the history of exploration of our own solar system shows that moons are generally much more likely to bear internally heated oceans than theory had previously anticipated) then the diverging properties of the light and dark hemispheres of the moon would be less dramatic than for the red dwarf system. 2) A wind-swept terminator zone where the falling air from the light side moving into the frigid dark side creates an endless freezing gale. 4) A permanent storm system directly facing the parent star, whose turbulence would preclude habitability below it. This theoretical description enhances the vision of the Dark Star home-world I offered in 'The Followers of Horus' in 2010. 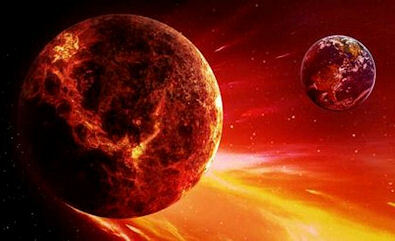 Strangely, it makes the vision of a planetary 'Eye' even more vivid, and plausible. The 'pupil' of this planetary eye is provided by the permanent storm-system which gazes eternally upon the Dark Star. 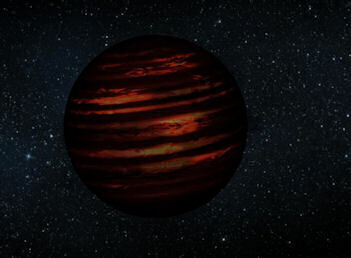 When is a Brown Dwarf not a Brown Dwarf? When it's a 'free-floating planetary mass object'. Boom boom. The nearby brown dwarf in question is most probably a member of the 200 million year old 'Carina-Near moving group' of stars, located a mere 21 light years away in the constellation Pisces. Because the age of the star cluster is reasonably well established, this provides a calibration for the likely age of free-floating objects in the group, including sub-brown dwarfs which are generally notoriously difficult to determine the age of. Analysis has forced astronomers to conclude that the brown dwarf (or 'T-dwarf' in astrophysics parlance) SIMP0136 isn't actually a brown dwarf at all (1). Instead, its mass falls fractionally below the margin usually associated with deuterium burning - the process which makes brown dwarfs star-like. As a result, SIMP0136 has had to be re-classified as a planetary-mass object floating freely through interstellar space within this young, mobile star cluster (2). This makes this interstellar gaseous planet an exciting prospect of study. How did it form? Given that it sits on the lower boundary of brown dwarfs (which range in mass from about 13 to about 80 Jupiter masses), what kind of properties does it exhibit? What does that tell us about Dark Stars in general? Because this comparatively young brown dwarf is not 'attached' to a given star, but instead is associated with a cluster - akin to a shoal - of stars moving through interstellar space. As a result, the light emitted by this object is not overwhelmed by a parent star's. As a result, SIMP0136 can be studied. Indeed, it already has been, with astronomers having been able to discern this Dark Star's weather patterns and rotational period (3). There's some additional context to this. Jonathan Gagné and his international team of researchers, who provided the evidence leading to this reclassification of SIMP0136, have been studying the populations of mobile star clusters more generally, and recently calculated that there is a missing mass within these loose structures of stars where sub-brown dwarfs should be (5,6). In other words, there is indirect proof from these clusters that the galactic populations of these elusive Dark Stars is much higher than many had previously accepted by astrophysicists. The reclassification of SIMP0136 fits well with the general thrust of this argument. I've often discussed the origin of various elements and compounds on Earth - most notably the isotopic ratio of water, and what that might tell us about the origin of terrestrial water (1). Data about this can help provide evidence for the Earth's early history, and often the data is inconsistent with the general theories of oceanic origin, like the 'late veneer theory', for instance, where the bulk of terrestrial waters were supposed to have been supplied by comets. It turns out that the water was on this planet all along (2,3), raising questions about why the Sun's heat had not driven this relatively volatile resource away from the primordial Earth during the early history of the solar system. "The scientists have been analysing tiny samples of ancient air trapped in water bubbles found in the mineral, quartz, which dates back more than three billion years. The team found that the air in the rocks is partly made up of an extremely rare form of the chemical element, xenon. It is known as U-Xe and what makes it so rare is that it isn't usually found on Earth. The component is not present in the Earth's mantle, nor is it found in meteorites. 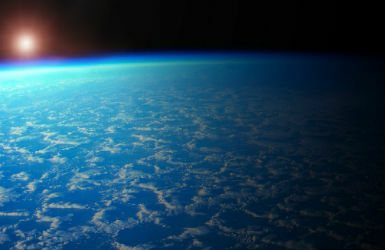 "Therefore, the team believe that the U-Xe must have been added to the Earth after a primordial atmosphere had developed. Simply put, comets are the best candidates for carrying the U-Xe to the planet. Co-author, Prof Ray Burgess, from Manchester's School of Earth and Environmental Sciences explains: "The Earth formed too close to the Sun for volatile elements, such as U-Xe, to easily condense and they would have rapidly boiled off the surface and been lost to space. It turns out that xenon, in general, is mostly absent from the Earth's atmosphere, particularly compared to other noble gases like argon. No one knows why. Perhaps the missing xenon is encapsulated within rocks buried deep within the Earth. Or perhaps, conversely, it has been driven off the Earth because it is not easily captured by rocks like perovskite (5). Xenon is missing from Mars, too, which may allude to its propensity for loss from a weak atmosphere. Evidence suggests the ancient Earth already had its volatile aqueous oceans in place, rather than being delivered to a desiccated planet by comet bombardment over time (2). The isotopic ratio of cometary water differs from that of the Earth, also suggesting that terrestrial waters do not originate from comets (6). Data from ancient rocks now suggests that xenon was also present early on, but is now largely absent from the Earth's atmosphere. What xenon is left on Earth has an isotopic distribution which bears little resemblance to those in asteroids, meteoritic chondrites and solar gases (7). This is itself anomalous - part of the 'xenon paradox' (5). These bizarre xenon isotopic distributions have led to the proposal of a theoretical xenon composition known as U-Xe (8), which represents the Earth's original primordial component. It is argued that this theoretical isotopic composition is what has now been observed in the quartz rock - dated to 3.3 billion years ago, and representative of the Xenon composition in Earth's atmosphere at that time (7). The argument is put forward that the xenon, at least, was delivered by comets at a late stage in the Earth's formation. In other words, xenon was not an original surviving component of the primordial Earth, but was delivered from the outer solar system late on by comets (perhaps during the late, heavy bombardment ~3.9 billion years ago)... and has now largely disappeared again. Earth waters more closely resemble waters in the outer asteroid belt. It is thought that migration of the giant planets, particularly Jupiter and Saturn, may have created significant fluctuations in the orbits of asteroids, causing them to cross paths with the Earth. 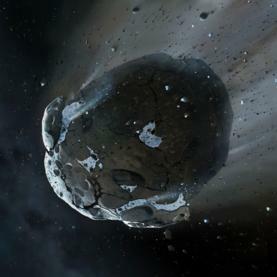 The outer 'primitive' component of the present asteroid belt would have originally formed in the outer solar system, but within a truncated primordial disk, and then delivered water to the Earth during the phase of planetary migration (9). Given that both water and xenon are relatively volatile, it is unclear how they survived solar wind/radiation bombardment when the Earth was in its unprotected, primordial state. The mainstream mechanisms proposed for their appearance and disappearance over time seem inconsistent, and increasingly complex. Into this heady mix, I'll toss the following astounding possibility: The Earth began its life between Mars and Jupiter, in the position of the current outer asteroid belt, beyond 3AU. It wasn't just the asteroids, Jupiter and Saturn that migrated about, but also our planet. It may have been catapulted into its present position through the intervention of a significant other, which caused all of this chaos in the first place, during the late, heavy bombardment. That significant other is the proposed 'Dark Star', sub-brown dwarf companion, Planet X, Nibiru, call it what you will... (10). The recent observation of the theoretical U-Xe archaic composition of xenon in ancient rocks might provide some evidence for this alternative viewpoint that the Earth started its life further out, and could therefore hold onto volatiles like xenon more easily - at least initially. Only when Earth shifted inwards, closer to the Sun, did the planetary xenon gradually get stripped away, leaving only primordial traces trapped in ancient rocks. This makes a lot of sense, doesn't it? But it requires a huge leap of thinking, cutting through the ever-present assumption that the Earth's place in the Cosmos is immutable.